Holy smokes. We tried grilling pizza for the first time this weekend. It's so much better on the grill than in the oven. Just another reason to fire up the grill! The grilled pizza I'm about to share with you all is absolutely the best pizza I have ever made. 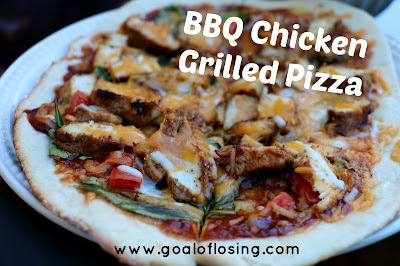 As my husband and I were eating this pizza we were thinking about all of the local restaurants in the area and we beat them all with this recipe; hands down! 1. Preheat grill to about 400 degrees. Spray tin foil, roll out dough. Dress up your pizza with the ingredients. 2. Grill pizza on top of tin foil with the lid down for about 5 minutes or until pizza crust is crispy and cheese is melted. If this isn't the best pizza you've ever had, please send me an email and I'll send you your money back. Oh wait, this was free. Nevermind and you're welcome! Hint: for a thicker crust, try using 1/2 the recipe of Easy No Rise Pizza Dough instead of just 1/4. Readers, have you ever tried grilled pizza? What is your favorite kind of pizza?